Witch hazel grows wild on the Atlantic coast of North America. This shrub, which can grow into a tree up to 8 meters high, appears bewitched in many ways. In the autumn, when most of nature begins to rest, fragrant yellow flowers with narrow, ribbonlike petals, appear between the hazelnut-like leaves like harbingers of spring, enveloping all the branches like small stars. The longish fruits, angular at the top, do not mature until the following summer to autumn so that the shrub bears fruits and flowers at the same time. When the fruit reaches full maturity it bursts open at the top scattering its seeds to a distance of several meters. Hamamelis has astringent, anti-inflammatory and anti-oxidant properties. It is used for adjunctive treatment of diarrhea and inflammation of the gums and the oral cavity. Witch hazel is also used for poorly healing wounds, vein care, hemorrhoids, varicose veins and atopic dermatitis. In homeopathy it is also used to treat period pains and heavy menstrual bleeding. The name hamamelis is made up of the ancient Greek words "hama" meaning simultaneously and "melon" meaning apple or fruit, a reference to the simultaneous appearance of flowers and fruit on the shrub. The name may also come from the word "hamatus" meaning hooked, angular, which refers to the shape of the fruit. The first people to use witch hazel for its healing properties were the North American Indians. European settlers saw the amazing healing effects they achieved with this plant, which was how it found its way to Europe in the 18th century. Incidentally, the Indians also used witch hazel branches to make bows and as divining rods to locate water and mineral deposits. The firming effect of witch hazel appears to be reflected in the controlled expression of the shrub: its growth is reserved rather than luxuriant; the flowers, which are not luxuriant in appearance either, are held back until the autumn; the leaves are a little hard, stable in shape and do not wilt easily. As a shrub it is more closely associated with the earth and counteracts fiery, inflammatory processes. And the strong power of the sun appears to be concentrated in the witch hazel shrub, which absorbs the sun throughout the spring and summer and does not release any of the collected energy. Only in the autumn, with the blossoming of the star-shaped flowers, does it open itself to the aerial, astral realm. Thus the flowers are also pollinated by the wind. The plant gives us the entire concentrated power of the sun and thus stimulates our metabolism. 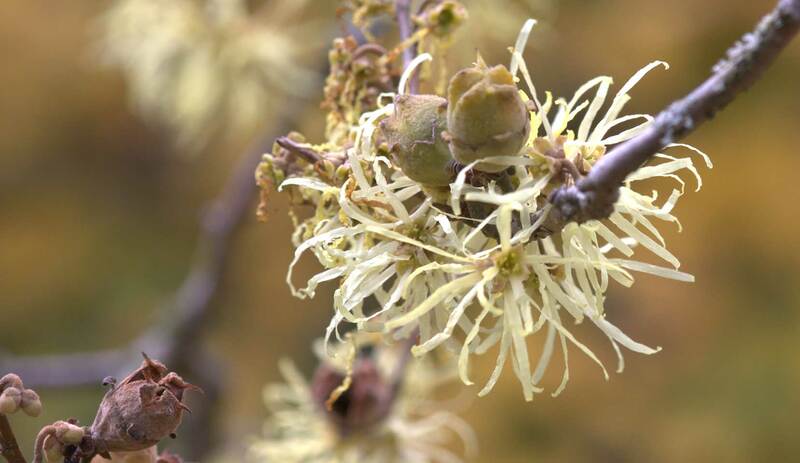 Witch hazel is one of the key plants in Dr.Hauschka Skin Care. WALA essences from the leaves and bark are used in almost all face care products and in many of the decorative Cosmetics. With hazel water ist used in Regenerating Neck and Décolleté Cream. The plant is valued for its astringent and firming effects and its stimulation of connective tissue. Witch hazel thus helps to give a clear, rosy complexion. On account of its astringent and anti-inflammatory properties, Dr.Hauschka facial toner is also particularly suitable for use as after shave lotion. In Dr.Hauschka Med Sensitive Saltwater Toothpaste and Children Sensitive Orange Tooth Gel witch hazel water fortifies the mucous membranes of the mouth.